Both business and leisure travelers will be drawn to the first-rate Hilton Garden Inn in Fairfield. 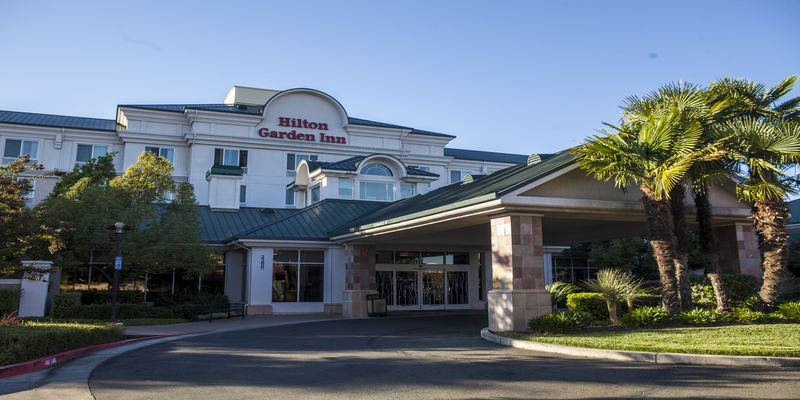 The Hilton Garden Inn Fairfield hotel provides easy access to many attractions, including Suisun Valley, Napa Valley, Jelly Belly, Six Flags Discovery Kingdom, and the Vacaville Outlets, while serving as the perfect midway point for travelers between San Francisco and Sacramento. Unwind in a spacious guest room or suite, and enjoy the latest technology and conveniences to make the most of your stay in Fairfield, California. Sleep in a comfortable Garden Sleep System® bed, and surf the web with complimentary internet access in each room. Indulge in a delicious meal inside the hotel restaurant, open daily for breakfast, lunch and dinner. For more casual eating, visit the Pavilion Pantry® for sundries, beverages and ready-to-cook meals, ideal for your in-room microwave and refrigerator. Maintain your fitness regimen in the fitness center, or take a dip in the sparkling outdoor pool.